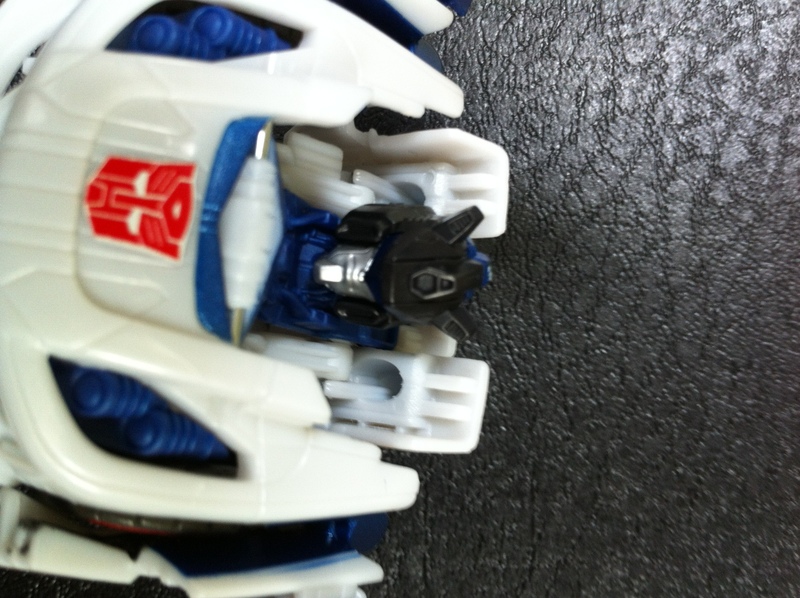 Jazz’s visor should be blue, and while FOC Jazz’s visor IS blue when the light piping is active, in normal light it looks black and that seems a bit off to me. I love RTS Jazz. LOVE HIM. He is the epitome of a Transformer figure to me. 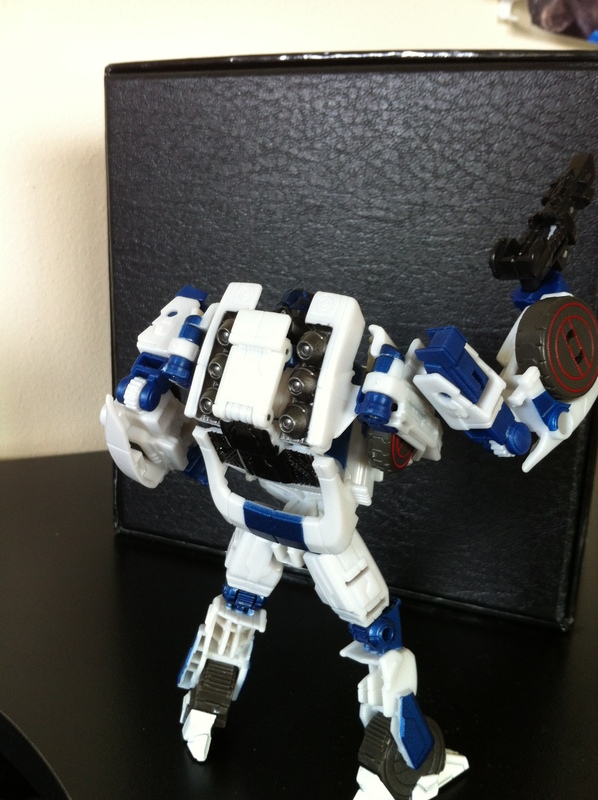 And seems I had a spare head from my Dead End project – all I really had to do was create a double ball joint (easier than it sound) and pop the RTS Jazz head on. 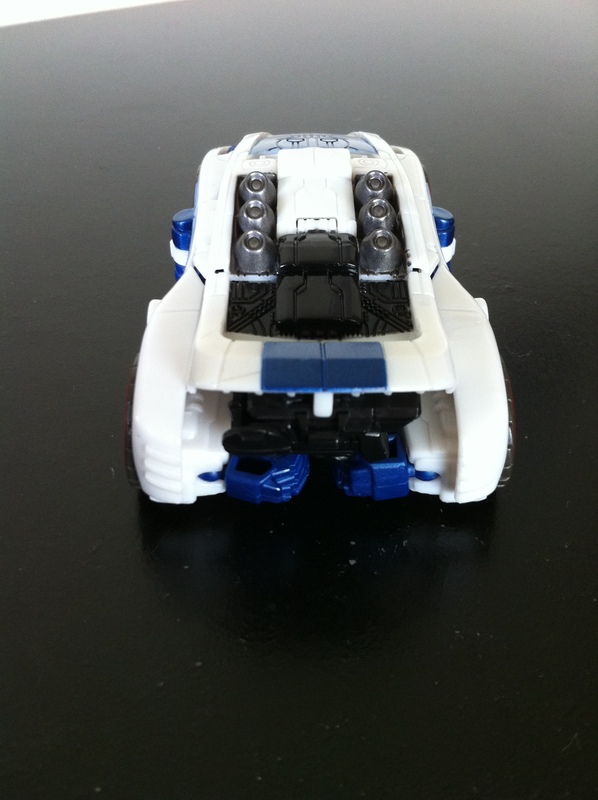 There is just enough black (mainly on the back in Robot mode) for the head to not look odd seems its not blue. 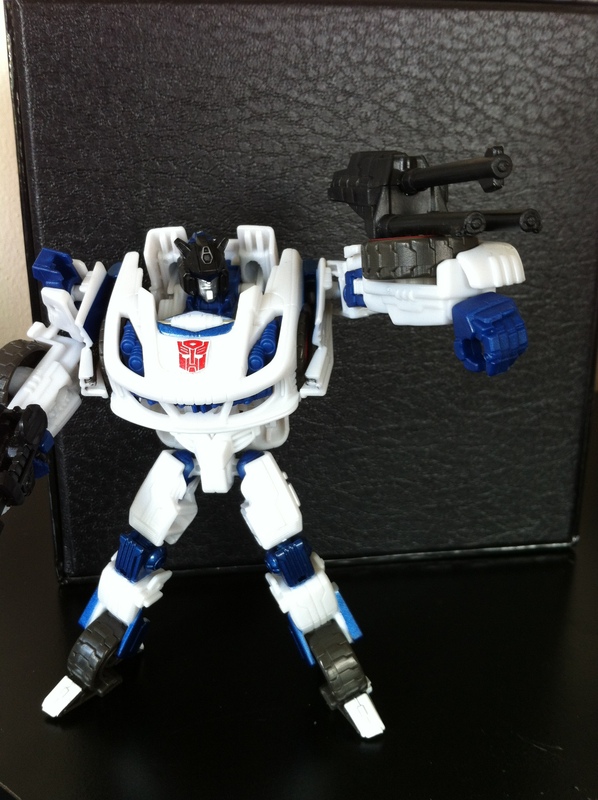 I also swapped pistols with RTS Jazz, but I’ll get into that later. 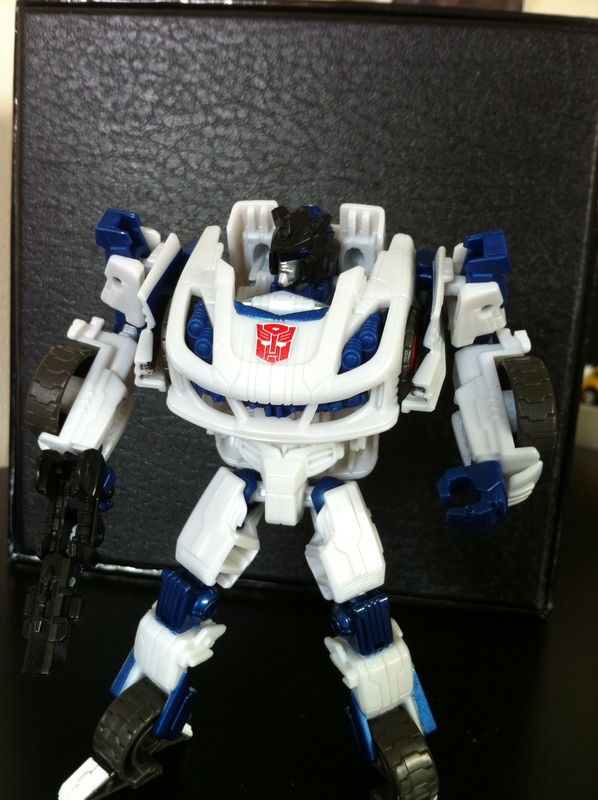 As much as I’m biased towards anything Jazz, there are some issues with the figure – for one thing, his waist piece should be black, or grey, anything but white. He looks too “All white” without some black in there to break up the waist and the chest. 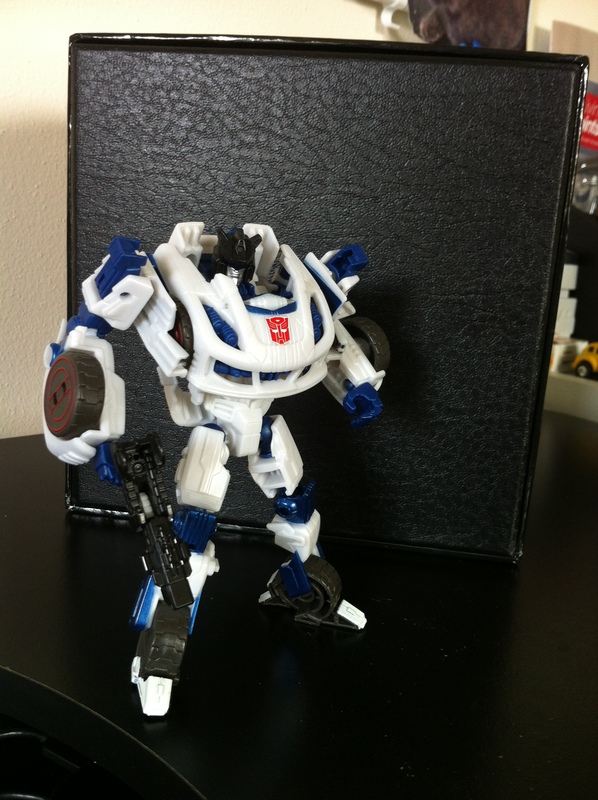 I also appreciate that Hasbro wanted the wheels in his ankles like the game model, and so had to basically mold them into the legs, but I think he could benefit from some ankle articulation. Its just a bit unfortunate that you can still see his front tires on the chest as well, making it seem like he has six sets of tires. One of my favorite parts of the design from the game model is how the thrusters end up on Jazz’s back – and luckily the figure does this just right! 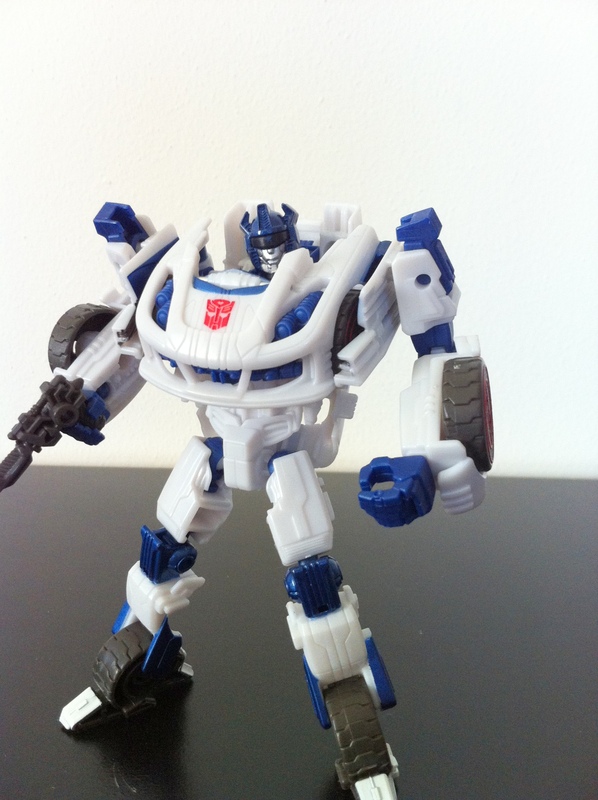 I still really like the robot mode a lot. If Reprolables doesn’t come out with a set to add some black/grey in there, I may consider painting the waist and adding some minor touches to spruce him up a bit. I mean…its spot on from the game. 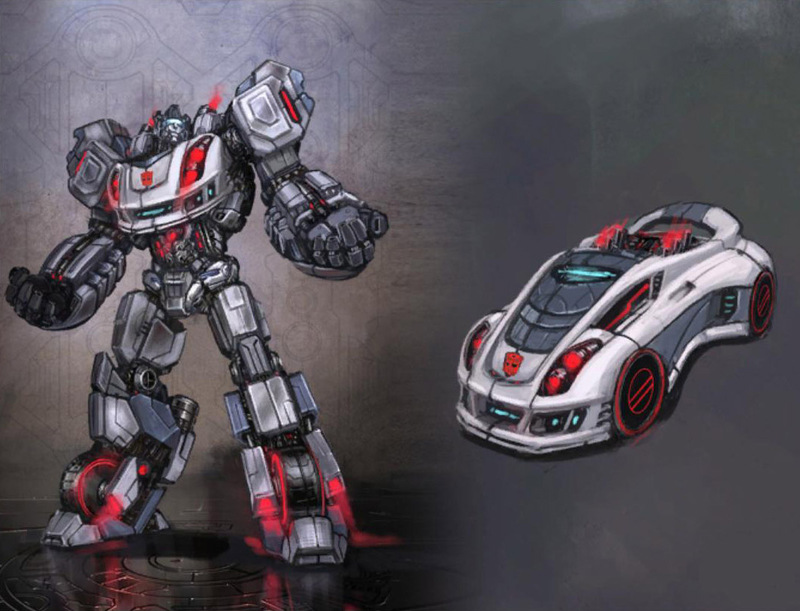 And I think it is rather ingenious the way they created the transformation – flaws and all. Hasbro’s trying to change things up a bit and I applaud their efforts. He can also just hold it, which works better. In the end, Jazz can do no wrong by me and while this mold has its issues, he’s still my favorite of the three, despite Shockwave being the common favorite. 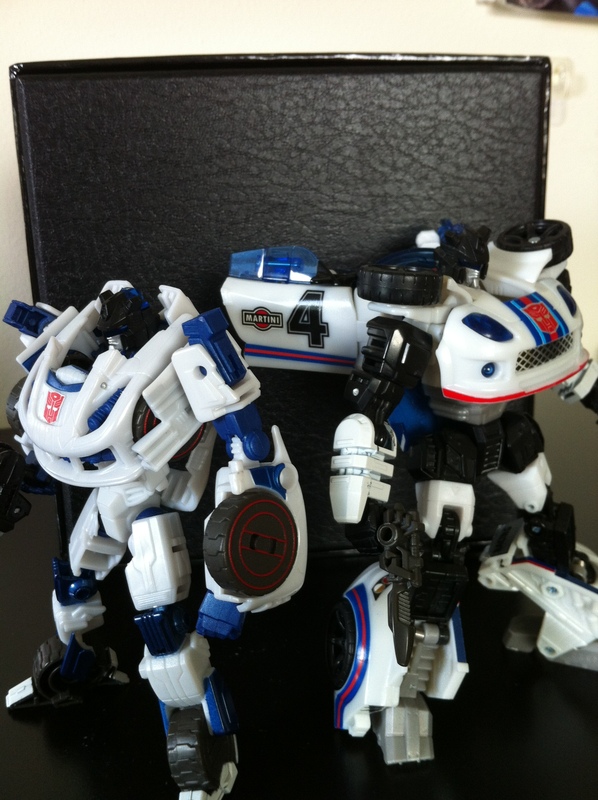 He tends to highlight the biggest issue with Prime, which is his size seems Jazz is as tall if not a touch taller (with the original head) than Optimus. But that’s not Jazz’s fault…he’s just too awesome. 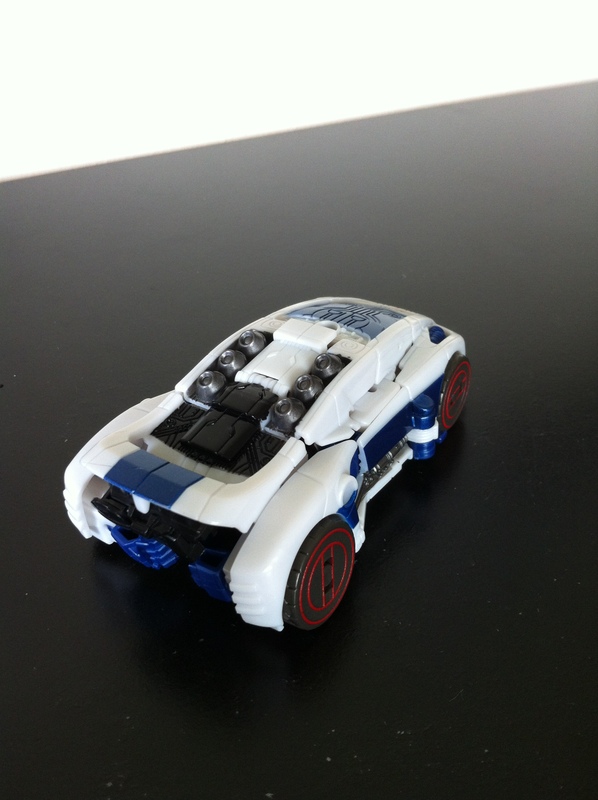 Just picked him up today and you’re right about his car mode being the superior form. Yeah. 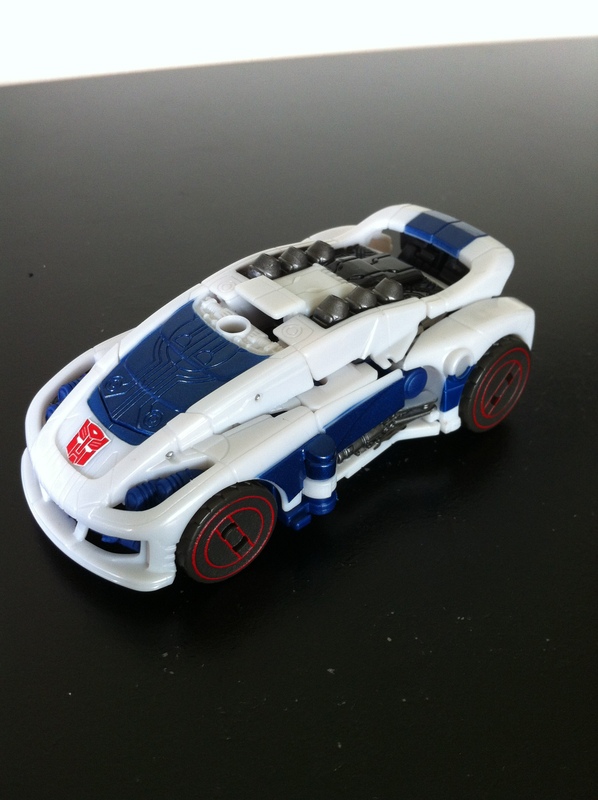 Car mode is a home-run. Robot mode is a B – at best. But Jazz is my bot so it’s all fine for me! Honestly I don’t remember much, but I had a ton of spare gunpla parts from old Gundam Kits and kit-bashed something out of there. 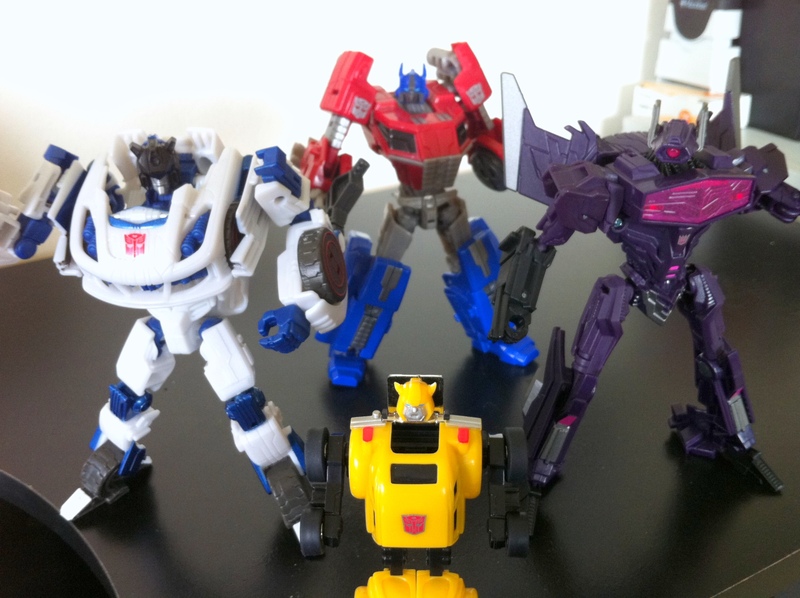 When all is said and done, you may want to wait and see if the current Siege line comes out with a Jazz or look at picking up the Power of the Primes version.